On 13 February hundreds of campaigners gathered outside the Home Office in London to protest against the detention of women who seek asylum in the UK. 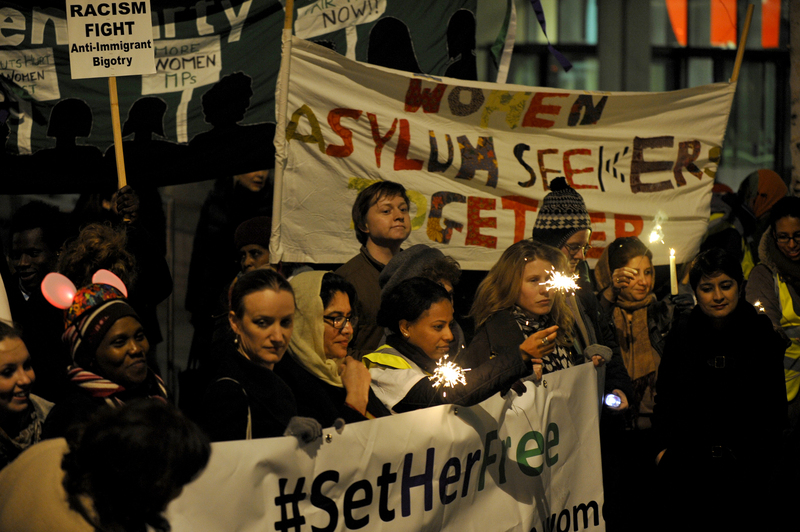 Women for Refugee Women had called this gathering to ‘Shine a Light’ on the detention of refugee women, and protesters brought torches, sparklers and glowsticks to light up the evening. 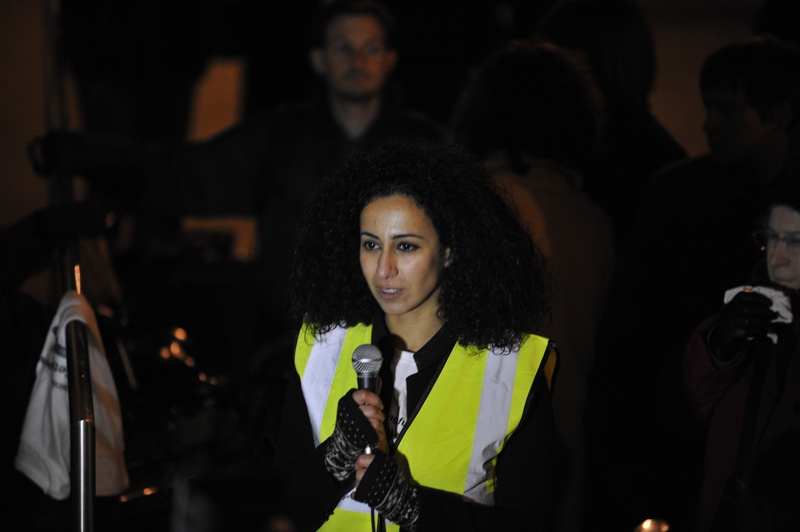 Among the inspiring speakers were Shami Chakrabarti, the director of Liberty; Caroline Criado-Perez, feminist campaigner; Kate Smurthwaite, comedian and activist, and Meltem Avcil, whose petition against the detention of refugee women now has over 25,000 signatures. ‘I am an internationally recognised human rights activist. But the Home Office has treated me like a criminal. I went on hunger strike when they brought me into Yarls Wood Detention Centre, I lost my ability to move and speak and even the will to live. ‘I have claimed asylum under article 14 of the international declaration of human rights, which states that everyone has the right to seek asylum from persecution. I fear for my life in my country. I left everything behind, my career and my family, to save my life and live in peace. ‘I requested protection from this country but they put me in detention and they wanted to send me back to my country by force. This is injustice. They did not respect that I am a woman and I have depression and come from a severe war zone. This is inhumane. ‘This experience shocked me and made me lose hope. Now I don’t have any desire to live and I am dying slowly from inside. They have broken everything inside me. ‘I am not a criminal, why have they locked me up for two months? Many organizations have sent them many support letters to explain my case but they have ignored them all. They ignore my previous humanitarian work, they ignore my academic background, they ignore all my evidence. 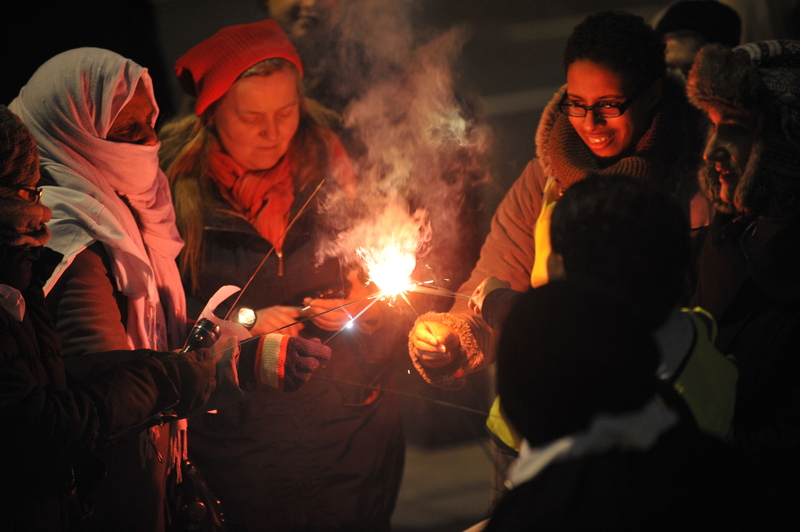 After the testimony, the crowd shouted Set Her Free and lit sparklers in support of the women in Yarl’s Wood detention centre. For coverage of the protest, see Allison Pearson in the Telegraph, Ros Wynne-Jones in the Daily Mirror and Sarah Cox in Bedfordshire on Sunday. This entry was posted on 18/02/2014 at 3:45 PM and is filed under Uncategorized. You can subscribe via RSS 2.0 feed to this post's comments. You can comment below, or link to this permanent URL from your own site.